This Sunday, November 20, I’ll be taking a Secret Garden Club smoking workshop – food-smoking that is. 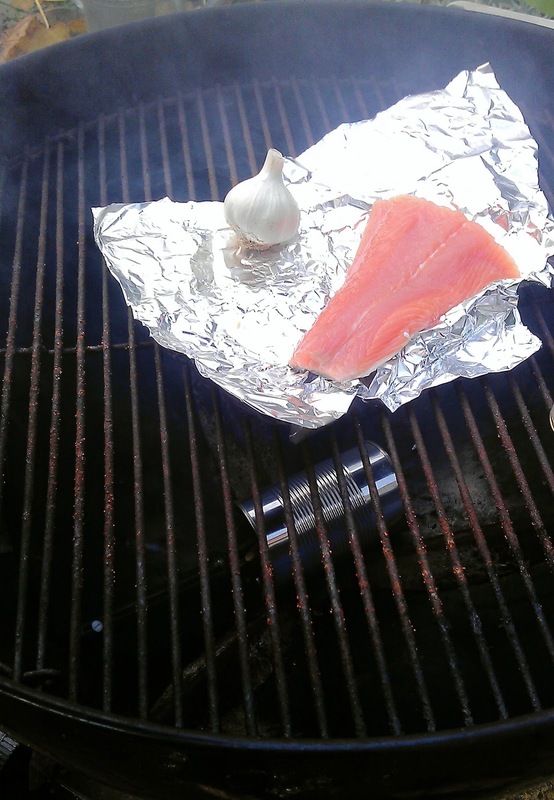 I’ll be demonstrating techniques for tea-smoking, and hot-smoking a variety of food and vegetables and then I’ll show how to build a simple cold-smoker using everyday materials for a minimal outlay. This is the first in a series of Secret Garden Club food and gardening workshops and a joint venture with MsMarmiteLover of the Underground Restaurant Supper Club fame. While I’ll be providing the gardening tips and info, MsMarmite will be showing how to turn garden produce into delicious food for attendees to sample. Click here for more details and booking information. Smoking might not have too much to do with horticulture, although we’ll be using homegrown foodstuffs as far as possible, but we’ll return in December with an alliums masterclass – a discussion of the onion family from chives and garlic to onions and leeks and taking in exotica such as Egyptian walking onions and Walla Walla sweets along the way. We’ll plant out some garlic and harvest some leeks. In January we have a workshop on herbs and medicinal plants. This session will also look at growing produce in a restricted space – you don't even need a garden to grow herbs – a pot or windowbox will do nicely. Beating the limitations of a small or non-existent garden will be addressed again in February when we investigate at some ingenious ways to raise potatoes and also in March when we’ll show how to have homegrown salad leave son your doorstep all year round. The sessions will be informative but informal – there’ll be lots of interaction and lots of time for questions and to discuss your own particular gardening issues. The food and drink will be stellar and there will be goodie bags to take away and inspire you to successfully grow your own however big or small your plot. Interested? Go to http://www.wegottickets.com/undergroundrestaurant for details of timings and prices. You can also keep in touch with our Secret Garden Club blog which details the sessions as they happen and where you can comment and ask questions. Not the biggest pumpkin harvest ever – a labelling mix-up meant I ended up with three more courgettes and three fewer squashes than I thought I had – but some good eaters here. The grey-green fruit are Berrettina Piacentina, from Seeds Of Italy, whose flesh is bright orange in colour with a dense sweet flavour somewhere between sweet potato and chestnut. Similarly, Marina di Chioggia, which has knobbled skin and that distinctive ‘Turk’s turban’ bubble at the bottom. For some reason, my Marina di Chioggias are always smoother-skinned than most, but again, fine eating. Only one Butternut this year: they started fruiting very late, and had the warm start to October continued, ooh, for another six weeks, I might have had a much more substantial crop. A sunny end to the summer helps to ripen pumpkins and squash here in the UK, but they must be lifted before the first frost – freezing temperatures will turn them to mush. Once harvested, they need to be ‘cured’, left in a dry well-ventilated sunny place to further mature. If you eat a squash straight form the plant, it will taste very raw and green. Left for a couple of months the flavour develops and deepens. As with any stored fruit, they need to be inspected regularly for signs of rot, but most will last happily into the New Year and I find are at their best around Christmas-time. I have stored squash successfully right through until the next year’s harvest, but they are usually all eaten up by February-March. They grow fantastic leeks up north. You see them in greengrocers and supermarkets: long fat sturdy stems, fresh green splayed tops and sometimes a little mud still clinging to the frill of roots at the base. Obviously grown locally, these always seem to me to be proper Northern leeks. With a white stem like a small tree trunk, these leeks were made to be sliced thickly into casseroles or simmered whole and served in white sauce. I, on the other hand, grow Southern leeks. Slender, pale green stalks that could be mistaken for an overgrown spring onion, they have an elusive, sweet, almost nutty flavour. They would be lost in a casserole: better steamed and dressed with a vinaigrette when warm, or hidden in a tart with blue cheese. It's not that I'm growing a dwarf variety, both the Musselburghs (a pretty standard leek) and Gigante d'Inverno (even without speaking Italian, I can tell that's not supposed to produce baby-sized crops) have turned out this way. I enjoy growing them for the taste, but am always slightly embarrassed about their fragile skinniness, especially when the relatives make the journey down the M1 to stay, and on the customary allotment visit, end up staring at them, puzzled. Have I only just put them in the ground? Are they meant to be baby leeks? 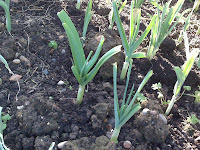 Or are they, indeed, spring onions after all? 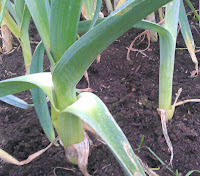 I do think that the presence of leek moth at our allotment has had an effect in previous years. These days, I cover the crop with Environmesh from July, when I plant out the pencil-thin seedlings, until now, when the leek moth caterpillars will have done their damage and settled down into their pupae. Leeks eaten by leek moth can be saved by cutting the plant right down to the ground and waiting for it to grow again, hopefully unravaged. But they are never going to grow back to gargantuan proportions. So I was beyond delighted last week when I removed the Environmesh to find the majority of the plants this year are indeed, if not actually Winter Giants, then definitely Proper Northern Leeks. 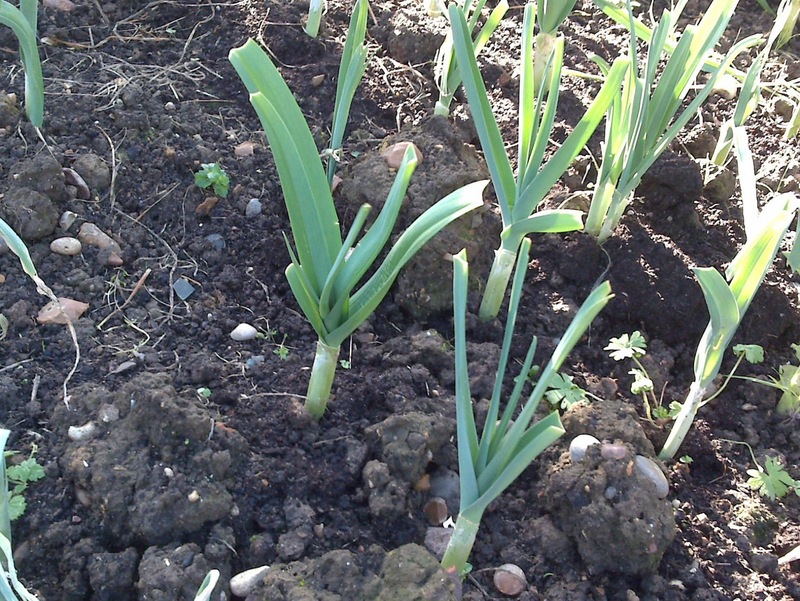 It may just be a one-off, a happy combination of weather and well-nourished soil in that particular bed, but at least I now know that I don't have to settle for spindly leeks.